Happy New Year Beckett peeps! We are awash with creative inspiration and are just giddy to take everything we learned last year and put it toward new challenges and styling. Here I present to you a complete – buckle up this will get… thorough – break down of our trend predictions for 2019. This having been gleaned from extensive internet (Instagram) digging – so when its 2 AM and I get yelled at for the cell phone light, I can snip back “its research sweetie”! We have studied New York Fashion Week with book worm intensity, and taken lots of notes on all of the designer’s artistry on buying trips. We LOVE dissecting every little thing about personal and cultural expression and delivering it to you in a beautiful bow, preferably one tied over a low pony tail. The faster we move into the technological age, the faster we are becoming nostalgic for some bygone era with more natural, organic, and sustainable materials that show curves and a little romance vs. stark white straight, modern lines. We want things that are not mass produced and that feel unique to our personal taste and expression. Who wants a computer drawn print necessarily, when you can have a beautiful little oil painting with a history! It is all about people made and not the mass produced. Especially as we have access to fast information, we have been promptly informed that our obsession with plastic and immediate must-haves, are quickly draining those same natural precious materials. Its no wonder we are yearning for the old French antique mirror and that beautiful round, hand carved, wooden cheese board! 1) Shop vintage! Whether that means Victorian lockets and lace bows, 1960’s Chanel accessories and pearls, or your parent’s old band tees – we love that its unique qualities give you a strong individual voice! 2) Organic lines. 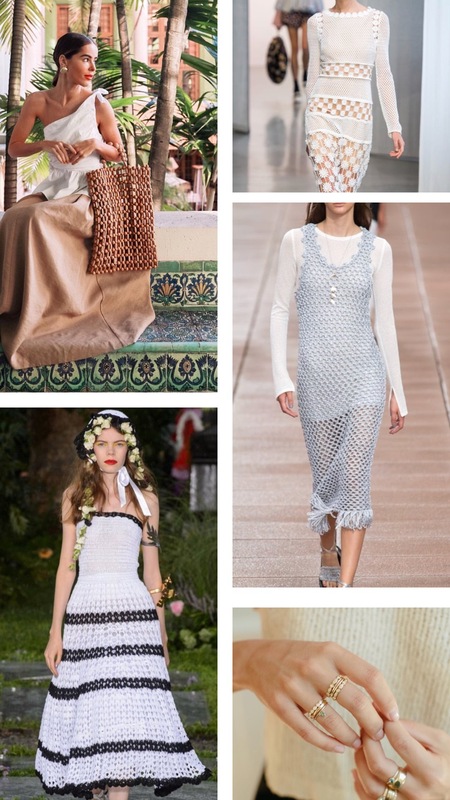 Netting and crochet were all over the runway (Oscar De La Renta, Rodarte, Self Portrait) and we think that the neutral textured look goes back to idea of incorporating the earth and crafted materials. 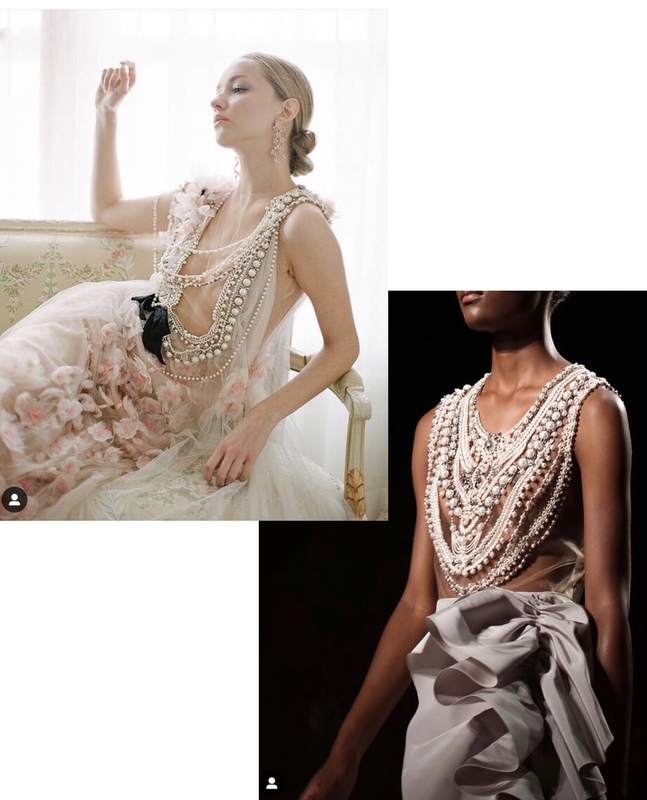 Look for more organic, romantic lines in your accessory designers – think raw edged golds, and bamboo structured handbags. 3) Think about ethical brands that focus on sustainability and clean fashion! London based Richard Malone, Stella McCartney, Mara Hoffman, and NYC based AMUR (carried at Beckett!) are all leading the sustainable industry and are fairly youthful and bright to boot! Sustainability doesn’t necessarily mean one neutral note. But, on that note… try to cut out cheap fast fashion. It falls apart in one wear anyway, and the human and environmental cost behind it is atrocious. 1) Vintage or antique finds again! This is no surprise, but keep it purposeful and personal! Mix the old world with the new and remember to have a voice, there is your house after all. 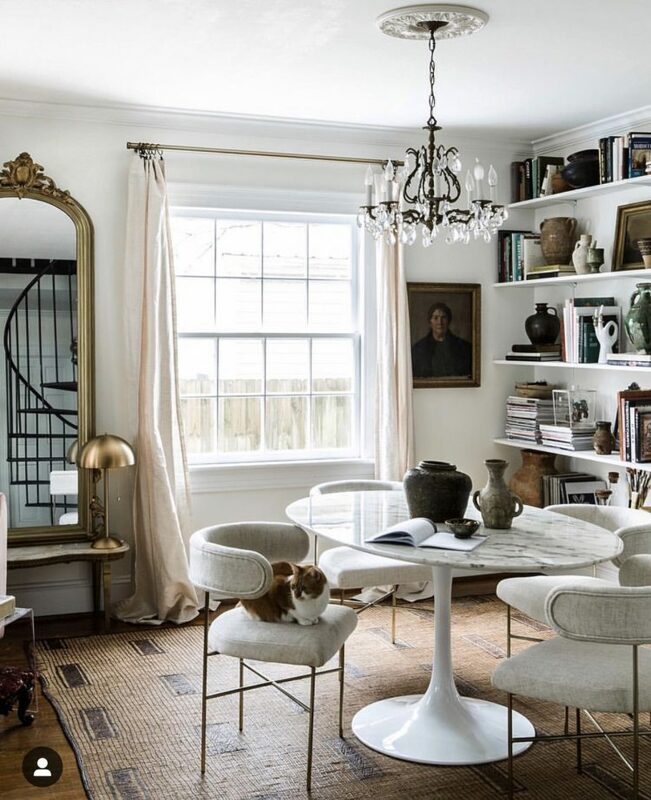 Think curvy softer lines, plush materials, and vintage brass mirrors mixed with your modern marble coffee table. 2) Bring in lots of stone, woods, and lasting crafted materials – stone fireplaces, wood elements in your kitchen, and old oil paintings and leather bound books. 3) Natural sunlight and plant life. 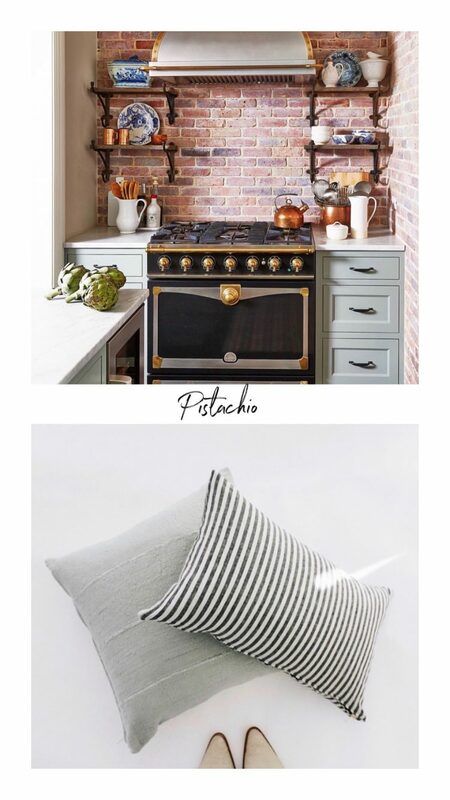 I don’t personally want a jungle in the house, but for the most part the more the merrier of each of these! It just bodes well for happiness, especially high windows facing the sun! These two color trends are happening at once. 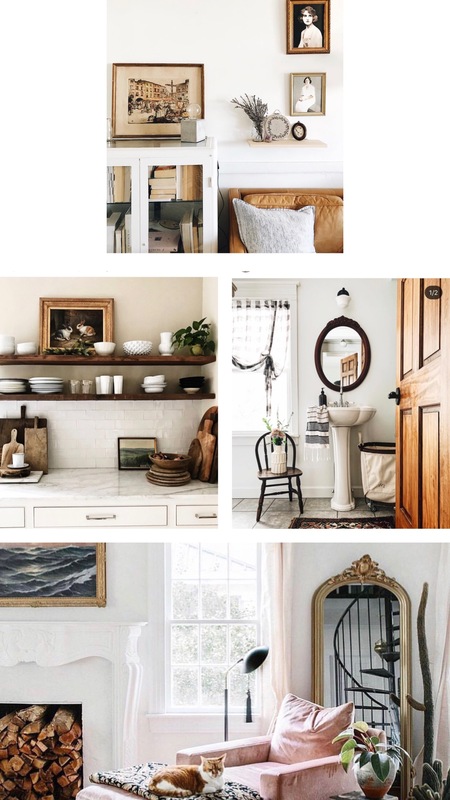 Home decor is moving away from the completely white washed Scandinavian vibe of 2018 with its minimal cut lines and focus on total simplicity, and toward a softer more plush and ornate palette. Our inspiration boards are filled with simple pops of saturated moody colors against a white or clean backdrop. Fashion is also mimicking this idea and embracing a total love of frills and thrills. Whether that means a nod to the Mad Hatter Victorian tea party with lots of textures and patterns (more on that in trend 3), or a complete tropical vibe incorporating an arm full of tangerine colors, puffed sleeves, and flowing skirts that drives its inspiration from a romantic and artistic Latin influence. We are excited to take all of this maximalism and celebrate dreamy whims. 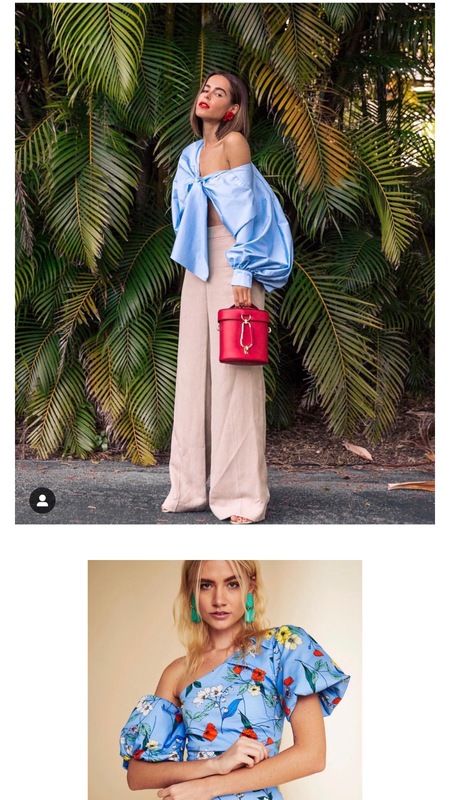 1) If you love the elegant and tropical Latin inspiration and culture like we do, opt for light fabrics and go rich on the bright sorbet or sun soaked colors! Sorbet lays somewhere in existence between a pastel and a bright neon. Just like the Victorian trend, this one embraces dramatic sleeves, but are often more billowy and statement-esque. This aesthetic is focused on being bold and dramatic, but with cleaner elegant lines – meaning you can handle a bright color, a bigger floral print, or loud embroidery! Go for poppies, yellows, bright light blues, and punchy pinks. We recommend grouping your outfit with a straw hat, or neutral textured bag and big sunnies to counter the vibrance. A touch of something sleek and modern also helps bring your outfit to the next level with more grounding elements! 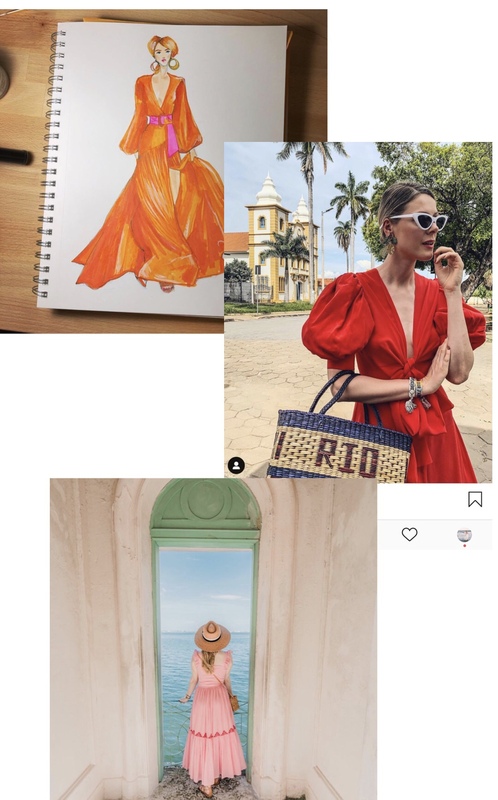 Honestly, look at @thestylebungalow for inspiration, we want to eat up her whole feed, or travel to other cultures like Cartagena Columbia and celebrate / get to know their beautiful artistry. We especially love the confidence this look radiates! 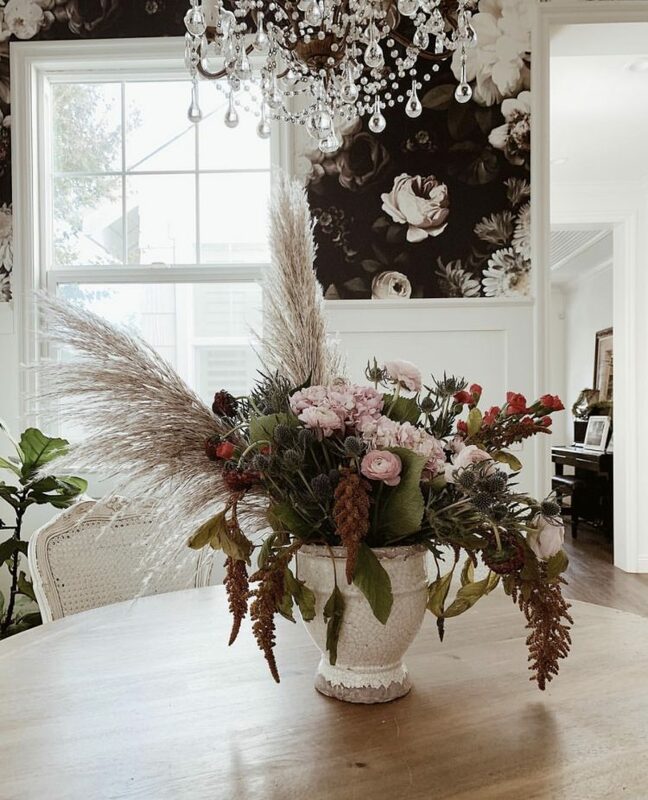 1) Grab something velvet, a little more ornate, and in a deep or saturated color and then layer that in with your bright whites and airy textures. This moody trend is all about softening a classic, feminine, or brighter look with a touch of a substance that is deliciously darker and less uptight. Something that makes you want to touch and sink into it. Think of a deep hunter green, or a dark burnt red/orange, or even a moodier blush, and use that as a pop against your buttoned up backdrops. 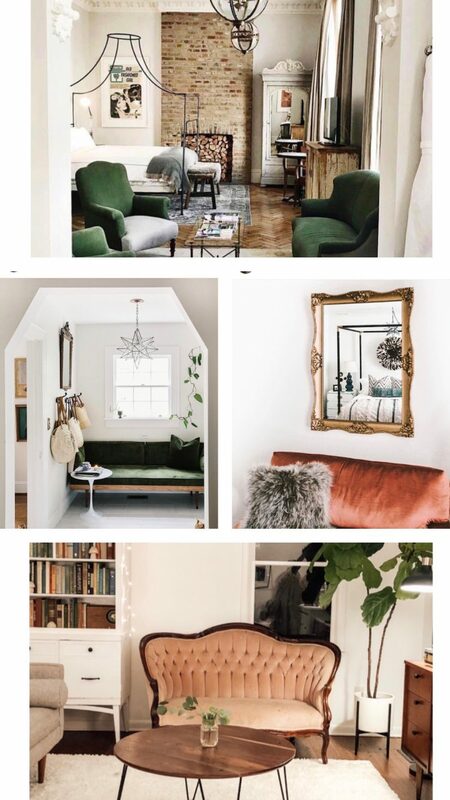 For example, a statement vintage velvet chair, a giant hunter green pillow, or an entire Satie just waiting for it’s Femme Fatale. 2) Not quite ready to sell your soul to the dark side? You can hit this trend simply by switching out your white Beni Ourain or Moroccan rug, with a dark oriental rug layered over an ivory seagrass. Boom! You’ve got depth. Picture it: you’re having a spot of fresh strawberries and smeared goat cheese on a loaf of freshly baked bread, all while sitting pretty in an English garden. Can you feel the sun beating at your eyelids and the sounds of the bubbling water across the pond? How about a little blue bird happily announcing the days report? Well, fashion is right there with you my friend! Spring is all about that ‘Je ne sais pas’ feeling – understanding the beauty of nature and reveling in its importance in child-like delirium. 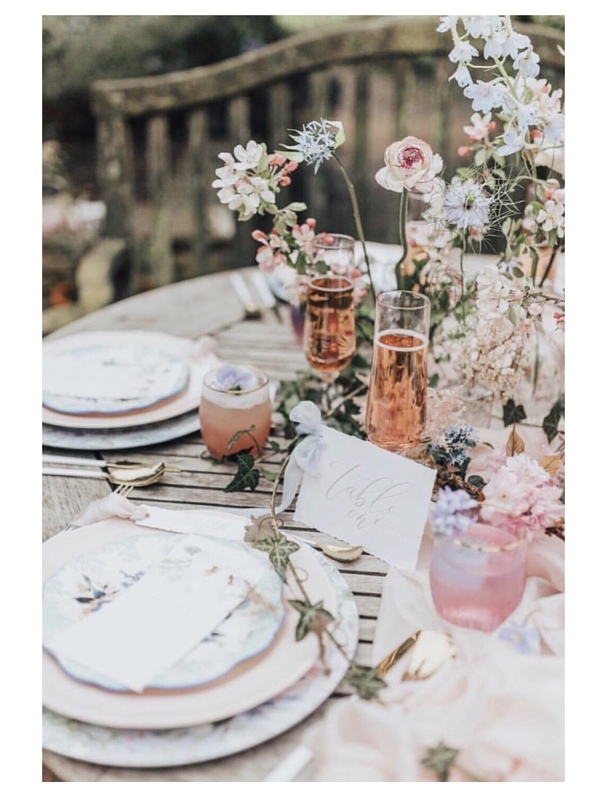 Floral patterns for Spring are certainly not ground breaking, but they come with that added intensity and yet in tandem with a light hearted “frolicking in a field” vibe this year. Let loose your inner Jane Austin and embrace a delicate explosion of floral prints. As for Leopard, I wouldn’t be caught dead near it a few years ago. Given the print’s relationship to power and symbolic with the animal, it is really not a surprise that it reads either very elegant – (Haute Couture Dior’s signature print), or completely campy and nothing in between. Not any more! Leopard has become the ultimate print for fashion RTW and I’ll tell you why in the tips! 1) Victorian Maiden: This category is your chance to be extra, extra with all the colors and lacy frills! If you are going for the Victorian maiden look (Love Shack Fancy, Needle + Thread), think about silhouette proportions as well as pattern. This looks comes with lots of dainty ruffles, puckered dots, and high necks. With all that detail and texture, you need softer colors and, most importantly, a smaller print sprinkled throughout. Make sure to think about the balance of your overall outfit. Going for a high ruffled neck or sleeve? Try a skirt length that is just a touch shorter, or tuck that lacy blouse into a high waisted structured short. You want to look purposeful and complete amongst all the information presented. 2) Leopard: Leopard print has been active in RTW scene for years, but it has just now exploded with new ferocity – excuse the pun. I am sure you have all seen the long silk leopard print midi skirt making its appearance throughout our Instagram feeds. Influencers have paired it with booties and a tucked vintage band tee or an oversized chunky sweater. The skirt gorgeously combines casual elegance with a certain cool factor we can’t get enough of. When leopard, as a statement, is combined with silk or very elevated lines, it isn’t overwhelming or “campy” for the wearer. Taking all those themes and mixing it with the casualty of a sweater or tee shirt will create a Purrrr-fectly effortless cool. Sorry, had to! Another easy way to make Leopard your new best friend is use it as a pop in your accessories – think shoes, or a statement bag or belt. Jenna Lyons, J. Crew’s old creative director, famously thinks leopard is actually a neutral – one that still packs a visual punch. 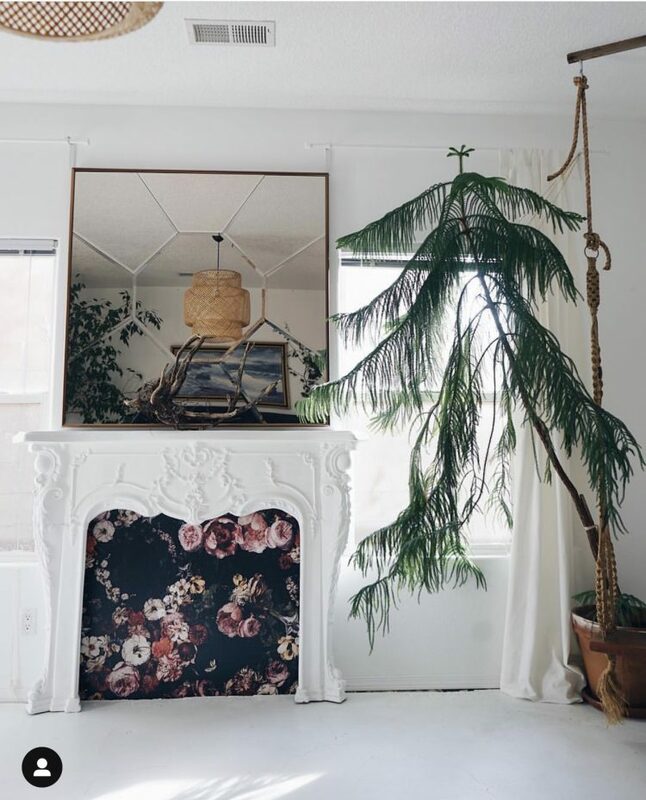 1) We aren’t sure if we love it or hate it yet, but we are definitely seeing giant florals on a jet black background as statement wall paper, and we are seeing it everywhere. If you want to try this out of yourself, use it as one bold statement on a very deliberate area of your house. For example: an extra bathroom you never knew what to do with, one wall in a children’s playroom, or in a fire place! What are you excited to wear or style in 2019! ?